When researching gluten, you'll find the term has two commonly used definitions — one that describes the storage proteins common to most grains, and one that's relevant to those of us following a gluten-free diet. Gluten, in its generic form, simply refers to the proteins grass plants build into their seeds (which we know as grains) to support and nourish the growth of the next generation of plants. Almost all grains have gluten — corn gluten, for example, works well as a fertilizer and a weed suppressor, while glutinous rice appears in many Thai dishes. However, those grains — and the gluten in them — are perfectly safe for people with celiac disease and non-celiac gluten sensitivity (also sometimes known as gluten intolerance or gluten allergy). 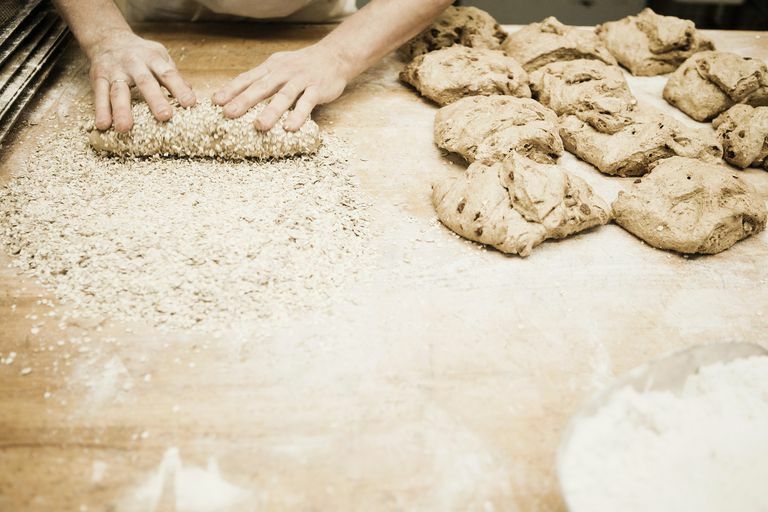 It's the gluten that occurs in a specific sub-group of grains — the Pooideae subfamily of the Poaceae family of grasses — that causes specific reactions in those of us who have celiac disease or are gluten-sensitive. The Pooideae subfamily includes wheat, barley, rye, and oats. When someone says they're following the gluten-free diet, they're not avoiding all gluten. Instead, they're avoiding that specific gluten protein found in the Pooideae subfamily of grasses. The gluten in wheat, barley, and rye actually consists of two proteins: gliadin and glutenin. When the two combine during the baking process, they form a thick, stretchy, glue-like substance that provides bread and other baked goods with elasticity and appealing texture. Gluten also helps bread dough rise by trapping (literally gluing) bubbles from fermenting yeast within the dough itself, allowing the dough to rise into a light and airy loaf. Sadly, the gluten proteins in other grains don't provide this same ability, which is why it's so difficult to find decent gluten-free bread. It's these qualities in baked goods that gave rise to the popularity of modern wheat (and to a lesser extent barley and rye). In fact, modern wheat has been bred to contain far more gluten than older varieties of wheat such as Einkorn wheat and spelt wheat, which makes modern wheat more toxic for those of us who react to the gluten in it. And it's no wonder gluten is so difficult to avoid: Wheat is the number three crop in the U.S. (behind only corn and soybeans), with 54.6 million acres in production in 2015 and 2.05 billion bushels grown (in comparison, only 2.6 million acres were used to grow rice in 2015). When you combine the statistics for wheat, barley, and rye, more farm acres are used to grow gluten grain crops than any other single crop — more than 58 million acres produced close to 2.3 billion bushels of gluten grains in 2015. In most cases (certainly outside of agriculture) anyone referring to "gluten" or "gluten-free" means the gluten contained in the grasses wheat, barley and rye (and sometimes oats). These specific types of gluten proteins cause the reactions seen in celiacs and those with gluten sensitivity. Unfortunately, because these grains — especially wheat — are so ubiquitous in our food chain, eating gluten-free involves far more than simply substituting gluten-free bread and other baked goods for the gluten-containing varieties. Gluten-containing ingredients appear in many processed foods, and anyone following a gluten-free diet needs to learn what terms mean 'gluten' on food labels.